Identifying dengue fever "hot spots" can provide a predictive map for outbreaks of chikungunya and Zika—two other viral diseases that, along with dengue, are spread by the Aedes aegypti mosquito. PLOS Neglected Tropical Diseases published the findings, the first confirmation of the spatial-temporal overlap for outbreaks of the three diseases, led by Emory University. "We had hypothesized that we would see some overlap between these diseases, but we were surprised at the strength of that overlap," says Gonzalo Vazquez-Prokopec, a disease ecologist in Emory's Department of Environmental Sciences and lead author of the study. "The results open a window for public health officials to do targeted, proactive interventions for emerging Aedes-borne diseases. We've provided them with a statistical framework in the form of a map to guide their actions." The analysis drew from eight years of data from Merida, Mexico, on symptomatic cases. A city of one million located in the Yucatan Peninsula, Merida had about 40,000 reported dengue cases during 2008 to 2015, and nearly half of them were clustered in 27 percent of the city. The neighborhoods comprising these dengue hot spots contained 75 percent of the first chikungunya cases reported during the outbreak of that disease in 2015 and 100 percent of the first Zika cases reported during the Zika outbreak in 2016. "Currently, most mosquito control efforts are not done until cases of mosquito-borne diseases are detected," Vazquez-Prokopec says. "But by the time you detect a virus in an area, it has likely already begun to spread beyond that area." Mosquito control efforts generally involve outdoor spraying that covers broad swaths of a city, further reducing efficacy, he adds. Outdoor spraying is particularly ineffective for the Aedes aegypti mosquito. "This mosquito is highly adapted to urban environments," Vazquez-Prokopec says. "It likes to live inside houses and to feed on people." 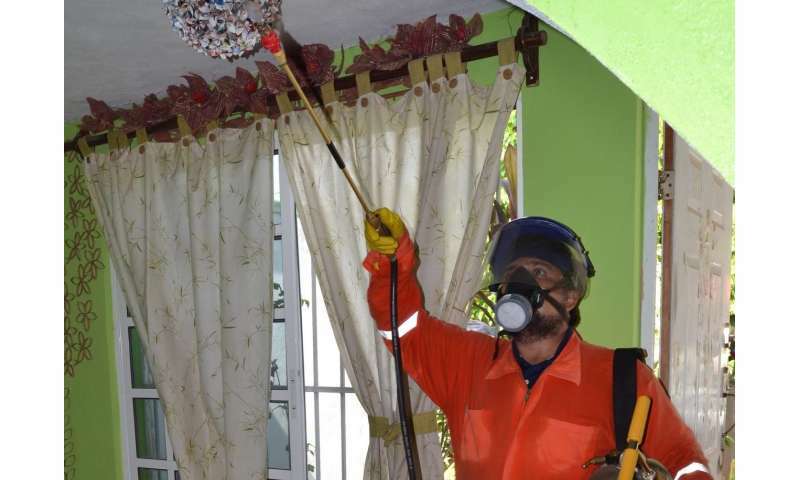 A targeted approach would make it more feasible to implement time-consuming and costly interventions such as indoor residual spraying. "The statistical framework that we have developed allows public health officials to harness the power of big data to do more effective and efficient mosquito control by focusing on high-risk areas—even before an epidemic begins," Vazquez-Prokopec says. The study used disease case reports at the household level and then scaled them up to neighborhoods to protect individuals' privacy in the final map. The hot spots for reported dengue cases were confirmed by data from laboratory blood tests of a cohort of 5,000 people. The analysis showed that people living in a dengue hot spot had twice the rate of infection of those outside of the hot spots. The research team included scientists from the Autonomous University of Yucatan and health officials from the state and federal level in Mexico. Other members of the team were scientists from seven other universities and health research institutions, including the U.S. Centers for Disease Control and Prevention. The researchers are now working with the Pan American Health Organization (PAHO) to develop a manual and training materials, based on open-access software, for mapping risks of Aedes-borne diseases to guide proactive interventions throughout urban areas of the developing world. More than one third of the world's population lives in areas at high risk for infection with the dengue virus, a leading cause of illness and death in the tropics and subtropics, according to the Centers for Disease Control and Prevention. Dengue fever is sometimes called "break bone fever" due to the excruciating pain that is among its symptoms. The chikungunya virus emerged in the Americas in 2013, sweeping through many countries where dengue is endemic. Common symptoms of chikungunya infection may include headache, muscle pain, joint swelling and rash. Zika virus followed in 2016, causing little alarm at first due to its relatively mild symptoms. It soon became apparent, however, that the Zika virus could cause birth defects in the babies of pregnant women who were infected. "You tend to see transmission go down right after large numbers of a population are infected with these Aedes-borne viruses, leading to herd immunity," Vazquez-Prokopec says. "But these viruses do not disappear. They keep circulating and can reappear later." Meanwhile, new Aedes-borne viruses are likely to emerge, he adds, as rapid urbanization and a warming climate help the mosquito thrive. Vaccines are not yet available for chikungunya or Zika, and efforts to roll out a vaccine for dengue are complicated by the fact that the virus comes in different serotypes. "Although effective vaccines would be the ultimate line of defense against these diseases, we cannot give up on mosquito control," Vazquez-Prokopec says.